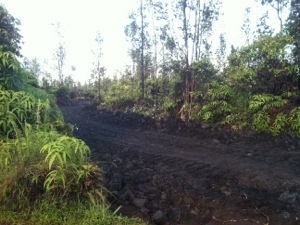 « New driveway to our pad! 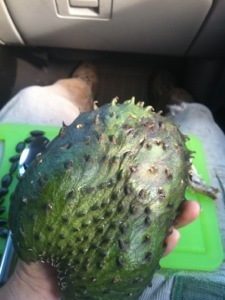 Below are pictures of our breakfast the past two days (soursop), and one of our new drive from the street. You can see pretty far in! Soursop is tangy and sweet. It is tasty and a lot of work to eat, similar to jackfruit in that respect but the taste and texture is totally different. 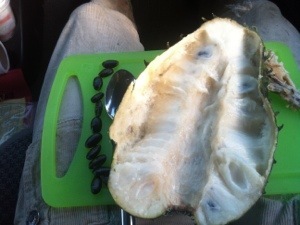 To eat soursop, the fruit is cut in half and then with a spoon, scrape or separate a piece, put in mouth and chew. That sounds pretty self explanatory, but each bite is chewy, like a natural fruit chewing gum. Some bites have a seed inside the fruit, inside a thin sack.